On April 12, 1961, cosmonaut Yuri Gagarin became the first human to travel into space when he launched into orbit on the Vostok 3KA-3 spacecraft (Vostok 1). Space fans take note: You can meet up with like-minded folks tonight (April 12) for a global celebration of space science and exploration. Tonight is "Yuri's Night," and events around the world will bring together people of all backgrounds, from children to former astronauts, for a global "Space Party." 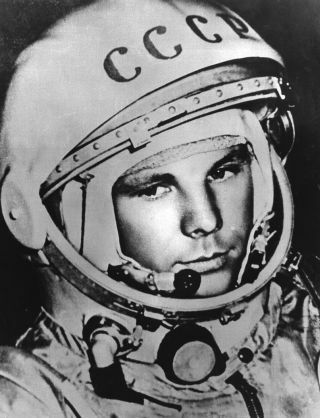 Yuri's Night is named after& Yuri Gagarin, the first human to make it to space. Gagarin launched on April 12, 1961, reaching a maximum altitude of 203 miles (327 kilometers). His Vostok 1 spacecraft made one orbit of Earth, staying aloft for 108 minutes. Because Vostok 1 didn't have engines to land softly, Gagarin parachuted out, making a safe landing. April 12 marks a huge milestone in U.S. space exploration as well. On that day in 1981, the space shuttle Columbia kicked off the shuttle program's first-ever spaceflight , blasting into orbit with astronauts John Young and Bob Crippen aboard. Columbia successfully capped off its two-day space mission with a safe landing, despite the loss of 16 heat-shield tiles. More than 500 individuals have flown to space since 1961. A few have died in the endeavor, and NASA remembers these fallen pioneers every year in a Day of Remembrance, which takes place on the last Thursday in January. Astronauts today fly to the International Space Station (ISS) using Russian Soyuz rockets, which lift off from Baikonur Cosmodrome in Kazakhstan. But NASA has contracted with the companies SpaceX and Boeing to build space taxis for U.S. astronauts. These private vehicles could begin flying in the next year or so. While the "space race" of the 1960s featured Soviet cosmonauts and U.S. astronauts, the field has now widened to include astronauts from many other countries. Sixteen nations alone participate in the ISS, while the Chinese have their own orbiting space lab, called Tiangong-2.